MONSTER HOUSE takes urban legend ten steps frightfully further by making the neighborhood “haunted house” a real MONSTER. Young teen DJ (voiced by Mitchel Musso) and his portly pal, Chowder (Sam Lerner), find that the menacing house across the street is actually eating people, with tricycles and basketballs as chasers. Owned by sourpuss, Mr. Nebbercracker (Steve Buscemi – now that’s scary! ), the whole property can come alive, the front lawn sucking objects underground, an inner carpet serving as a lashing tongue and the nearby trees turning into grabbing claws when necessary. A technical wonderpiece, director Gil Kenan‘s use of cutting edge “performance capture” animation (placing sensors on actors’ faces as well as their bodies) and his ingenious tracking camera gives this 3D cartoon the feel of a live action movie. Adults will be technically delighted, teens might be somewhat amused and little kids won’t even conceptualize the psychotic horror beneath the surface scares. The characters are so formulaic, I am typing this review with my eyes closed: DJ is the cute hero kid, Chowder, his dumb fat friend, Jenny (Spencer Locke), teen girl whom they both fall in love with, who is smarter than both of them (and who gravitates towards the skinny kid, of course); there’s the two-faced babysitter (Maggie Gyllenhaal), the stoner boyfriend (Jason Lee), the dumb cops (one fat and white (Kevin James), one skinny and black (Nick Cannon)); and of course, the oblivious parents (Fred Willard and Catherine O’Hara). The kids also find a concrete cast of a fat lady on the basement floor, which cracks open to reveal a skeleton beneath. That’s mighty hairy stuff for a pre-teener – and it gets hairier. We find out later that the skeleton belongs to Nebbercracker’s dead wife, Constance (Kathleen Turner), who was a Circus Fat Lady (touted as “the giantess as big as a house”) and was accidentally buried in the concrete while Nebbercracker was building the house for her. In flashbacks, we see that the morbidly obese Constance was a few slices short of a Sara Lee cheesecake, making Nebbercracker’s professed love for her almost as bonkers as she was. After she dies, instead of doing the sane thing, like burying her in a reputable cemetery, Nebbercracker constructs a locked cage around her concrete cast – and then wonders why the house could possibly be haunted by her enraged soul. If you can’t see how this kind of psychosis disguised as kiddie fare might be too dark for young kids, you’re as unbalanced as Nebbercracker. Before we know it, we’re in the third act Running and Screaming phase. And everything gets way out of hand as the house uproots itself and chases the kids and we lose all semblance of wonder. 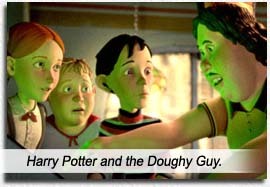 Ultimately, when MONSTER HOUSE wraps – with everything resolving as vanilla as possible – we are left wondering how something so three-dimensional could still be so one-dimensional. Writers: Dan Harmon, Rob Schrab, Pamela Pettler. Starring: Mitchel Musso, Sam Lerner, Spencer Locke, Steve Buscemi, Maggie Gyllenhaal, Jason Lee, Kevin James, Nick Cannon, Catherine O’Hara, Fred Willard, Jon Heder, Kathleen Turner.